Okonomi = as you like it. Yaki = cooked or grilled. How can you help becoming obsessed with such a dish? I currently want to eat these Osaka-style cabbage pancakes at every meal. My first few attempts at home were not great. Cabbage in crepe-ish pancake batter does not an okonomiyaki make. I tried some Korean panjeon mix and that was even worse. Finally, I called in an expert; Mayu Jensen. Mayu is married to Jeff’s cousin, Tim Jensen. Tim has lived in Japan for nearly 30 years. After a successful career in the Tokyo rock and roll industry, they moved to a traditional mountain house in Nagano. They visit every holiday season and sometimes tack on a little extra time because paper walls make for brutal winters. This year, while Tim and Jeff re-ignited their childhood slot-car rivalry, Mayu and I went to our excellent Japanese supermarket, Uwajimaya. She patiently listened as I explained my Osaka pancake theories, then she set me straight. Osaka pancakes are made with plain green cabbage, nothing fancier. You can stir in extras “As you like it”. Seafood and assorted vegetables are common. Strips of pork belly fried into one side are very popular. The batter should always include mountain yam (yamaimo) for proper viscosity. Sliced giant scallions (negi) are traditional, but green onions are acceptable. Chopped pickled ginger is highly recommended. When I reached for the jars of pale pink slices, Mayu gently guided me to the tubs of glaring-red shreds instead. She’s one of the most health-conscious eaters I know and the choice surprised me. She explained that a peppery, more assertive flavor is better here. I thought I had the rest figured out. I love homemade dashi and pay top dollar for good, big shavings of katsuobushi. I was confused when she almost imperceptibly scrunched her nose in gentle dissent. Topping a pancake with a heap of fluffy big bonito shavings that curl and shiver with the heat of the pancake might look intriguing, but apparently the small crumbles are better because they are tenderer and dissolve and season the dish instead of just dramatically garnish it. I wrongly disregarded the dusting of aonori-ko seaweed flakes, assuming they were about as relevant as dehydrated parsley, but was informed that they are essential. RiceKrispy-like tempura crumbs called tenkasu are crunchy but not crucial. 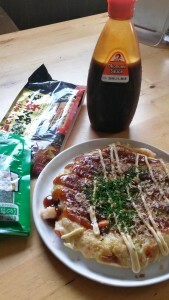 Mayu was pleased to see that Uwajimaya sold the “right” brand of okonomi sauce, Otofuku. She balked a bit at the endcap display of Kewpie mayonnaise. I assumed that she was uncomfortable recommending the highly processed, MSG-laced product because of her whole food and vegan preferences. Instead, she sheepishly admitted that while some people consider squiggles of mayo an unnecessary indulgence, she couldn’t imagine okonomiyaki without it. And then Mayu gave me a lesson I truly treasure. She directed me to a shelf of pancake mixes. She compared the ingredients and picked out two brands that included a respectable amount of yam and dashi. While fresh is always best, she assured me that there was no shame in stirring together a good quality instant batter now and then, as long as I had the right additions and embellishments on hand. So that’s what I’ve been doing. A lot. Going to Tanakasan restaurant and ordering a happy hour bacon and shrimp Osaka pancake and a pint of Stoup IPA is another excellent option.